New York, NY, then London, England. Publisher: Hutchinson & Co.. Editor: Victoria C. Woodhull (Mrs. John Biddulph Martin), Zula Maud Woodhull. 1/1, July 1892-1910. 16 pp., 50 cents/ 2s 6d a year. 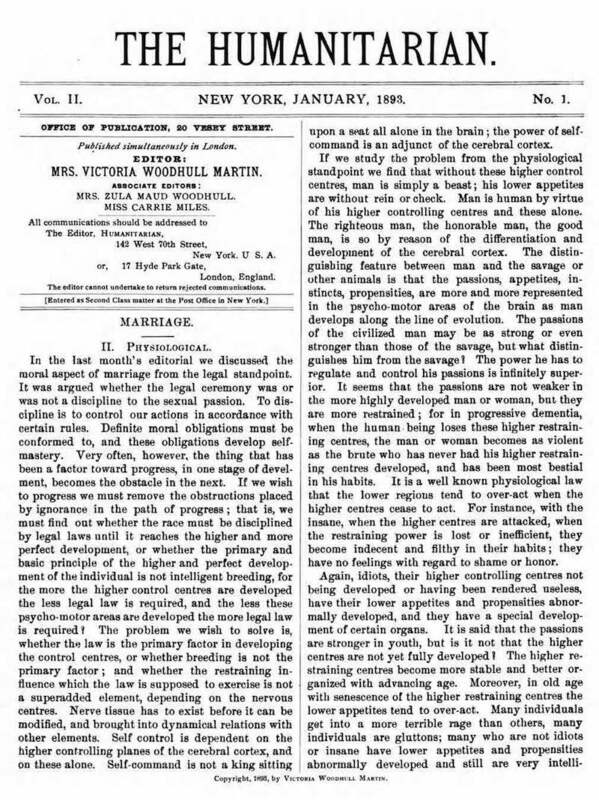 Though the journal was primarily devoted to eugenics and social issues, it was, as the Banner of Light, August 7, 1897, noted,"reformatory, progressive and devoted to psychic studies," with the last topic increasingly coming to light as the journal progressed. It was largely written by Woodhull but attracted contributions by Paul Tyner and other New Thought writers and published, notably, an article on the workings of the Golden Dawn Temple in Paris, complete with photographs. "Isis Worship in Paris. Conversations with the Hierophant Rameses and the High Priestess Anari," February 1900. Mrs. Martin is the re-fashioned Victoria Woodhull after her removal to England and marriage to the millionaire John Martin. On Woodhull, see the note under Woodhull & Claflin's Weekly. Zula Maud (1861- ) was Victoria's daughter, possibly by Canning Woodhull.